Our product range includes a wide range of cpvc pipe and chlorinated polyvinyl chloride pipe. CPVC Pipes are used for various industries like metal finishing, plating and treatment, pulp and paper. They are safe to use and have high flow capacity for water supply. We serve these pipes to our customers at very effective prices. We serve CPVC pipes to our customers at very effective prices with world class quality. 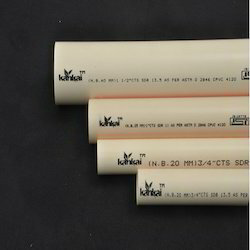 Looking for CPVC Pipe ?